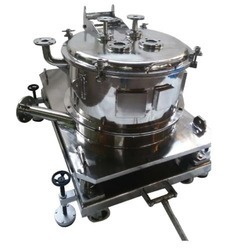 We are one of the leading manufacturers and exporters of Centrifuge Machine. The offered centrifuge machine is designed as per the set industry norms using best grade material under the direction of experts. Centrifuge Separator is designed for the application of centrifugal force to a mixture of two immiscible liquids suspended solids heavier than either liquid. As per the specific needs of the clients, we are engaged in providing a high quality range of Laboratory Centrifuge Machine. Nirmal Centrifuge Blanketing System are Skid Mounted ready to use, continuous Innertisation (Blanketing & Purging) systems for safe operation of centrifuges. - Bench Top Digital speedometer, Digital timer of range 0-59 minutes and variable speed regulator. - Maximum speed 5200 r.p.m. (without load). - Fitted with light weight double walled lid made ABS plastic moulding.